Liz Lothrop Update: Yay, we are home! It is a bitter sweet homecoming. It was very hard to leave Leah and her mom, Ellen. We have become good friends over the past few weeks that Liz and I have been in and out of the hospital. Last night was a tough one for our girls and the other parents on the floor. There was a "code Blue," which is where someone stops breathing. We happened to be in the hall and had to go into the parent lounge and out of the hall. Our girls were inquisitive, especially given their own fate with cancer. Both girls know this boy and his parents, it was very difficult. Alex will be turning 13 next week. I would like to ask anyone reading this blog to stop and pray for God's miracle healing of Alex before reading on.............................................Thank you. Being on this floor can be quit depressing. I have found that you must find the joy that is on that floor and not dwell on the pain of the families. There is a time to stop and pray and give blessings for the answered prayers and also a time to realize how blessed one can be on this floor. It is also a time to realize one should never dwell on the evils or injustice of this world. The children on A5 south do not dwell on it and I promise I will not either. It is a waste of energy, energy that can be spent on making these children and their families smile; that to me is so much more gratifying and I feel that is the way God intended for it to be. Elizabeth is doing great. This round of chemo was easier than the first round. She slept like a normal kid, hours were different of course, but the same amount. She felt sick the last hour or two of the 24 hour chemo drip but that was it. She was up running and playing when she was not sleeping. The doctors were all teasing her and asking if she was the same kid that spent 33 days straight in her room and would not come out to meet anyone! She will have blood work this Thurs., with clinic on Friday at 11:00 am. She will have the GRF, four hour kidney test, next Thurs. with an admit next Fri. if her counts are high enough; ANC of 750 and platelets of 75K. mouth sores, she has a few of them starting again. most importantly, pray for Alex and a miracle healing. May you feel God's love, peace, and blessings as we do and as we try to share that with the families on A5 south. I love that picture! Of all the pics you took that day, that one's the best. 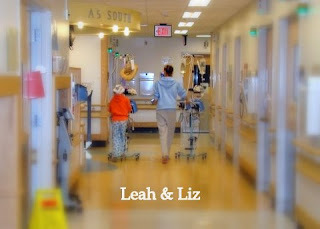 Leah looks like a little nugget and Liz looks like a big sister. So cute! I'm glad things went more smoothly this time. I'm still praying for all every night and whenever I think of it.